Technology is always improving, and you can see it easily in how often new phones come out. But with something like furnaces, that you have for decades and don’t look at every day, it can be easy to miss how things have improved. Today let’s talk about some of the innovative features that come with modern state-of-the-art furnaces. An older furnace typically only has one speed for the fan. The blower on a recent model has two or sometimes three different speeds, giving you more control over circulation and how quickly warm air is delivered to the rooms. If your furnace only operates at either on or off, it’s behind the times. Modern furnaces have staggered levels of operation to better arrive at your set comfort level. Older furnaces arrive at a given temperature by running full blast until the thermostat says it’s enough, and that meant a lot of switching on an off. With multi-stage operation, newer furnaces can hit your desired temperature at a more efficient pace. Conventional furnaces often started blowing air as soon as the burner went on. Since it took the burner a little while to get the air really warm, this meant that the furnace blew cold air for the first minute or so. State-of-the-art models solve this by simply putting a little time delay on the blower, delaying its operation until there’s actually warm air to send out. An old style furnace relied on one heat exchanger to transfer heat from the burner to the vent. The furnace then blows warm air to the house, and any waste gas is evacuated through vents. Much of that waste gas is still warm, meaning any heat in it is wasted and decreases overall efficiency. A condensing furnace has a second heat exchanger fitted near the exhaust port to gather as much heat as it can from escaping flue gas. Salvaging the heat from that gas gives condensing furnaces an efficiency in the 90% or more range. As the name suggests, condensing furnaces produce condensation when the heat exchanger rapidly draws heat out of the flue gases. The exhaust pipe is made out of PVC instead of metal to avoid corrosion. A condensing furnace still has to generate its own heat by burning fossil fuels, but it is much better than conventional furnaces at squeezing every last BTU out of that fuel. A lot of common furnace problems come down to ignition. 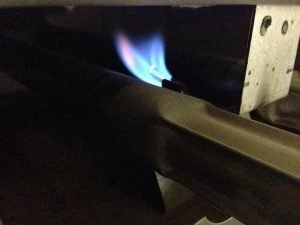 If the system doesn’t ignite properly, it’s designed to shut off the gas, since pumping it into an occupied space without burning it would be potentially deadly. Conventional furnaces have a standing pilot system, a pilot light that runs continuously and makes sure that the heat-producing burners run. This little flame is usually exposed to currents of air in the room, so something as little as a sudden draft can blow it out, causing the gas to shut off automatically. A standing pilot also has to stay lit around the clock, so that in the cold months, you’re constantly using fuel even if the system isn’t on. Newer systems have what’s called an intermittent pilot, which is electronic. When the thermostat calls for heat, the intermittent pilot creates and electric spark that lights the gas, and goes idle until called to do so again. While intermittent igniters cost a bit more, they can do away with a lot of frustration of having your furnace shut off at inconvenient times. Obviously a furnace is not something you replace just because there are newer models, but knowing about the latest comfort and efficiency features can still inform your decisions about your current system: how old is too old, and at what point am I losing money by keeping the old one? If you’re in the Northern Virginia area, Twin Air in Manassas is your all-in-one place for all your heating and air conditioning needs. If you have any questions about furnaces, efficiency, or such, call us at (703) 754-1062 or get in touch on our website.